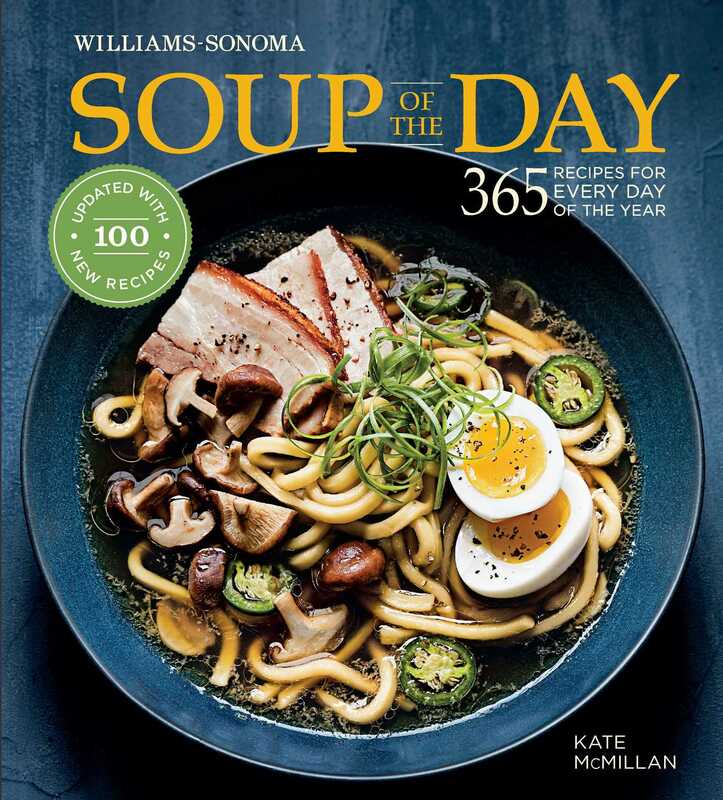 This revised edition of the 2012 best-selling title features 100 new seasonally driven recipes and a selection of new full-color photography. This well curated collection of recipes offers a delicious soup for every day of the year. Soup is often thought of as comfort dish for cold weather, Soup of the Day showcases how diverse soups can be. From light gazpachos to hearty chowders, cream of tomato to chicken noodle, vegetable-lentils to steak and potatoes, there’s something to please every palate throughout the year—and plenty of full-meal soups for easy dinner solutions. The recipes are categorized by month of the year and laid out in an easy-to-follow, calendar format. The monthly calendars highlight the season’s best ingredients to bring you fresh and delicious flavor combinations all year round. To make the gremolata, in a bowl, toss together the bread crumbs and 2 Tbsp of the oil. Transfer to a rimmed baking sheet. Bake, stirring occasionally, until the bread crumbs are golden brown and crisp, 15–20 minutes. Let cool to room temperature. In a bowl, toss together the toasted bread crumbs, parsley, and lemon zest, and season with salt and pepper. Set aside. In a nonstick frying pan, cook the pancetta over medium heat, stirring occasionally, until crispy and the fat is rendered, 8–10 minutes. Using a slotted spoon, transfer to a paper towel–lined plate. Set aside. In a large, heavy pot, warm the remaining 2 Tbsp oil over medium heat. Add the onion, shallots, and celery and cook, stirring occasionally, until softened, 8–10 minutes. Add the cauliflower and cook, stirring occasionally, for 1–2 minutes. Season with salt and pepper. Add the broth, raise the heat to medium-high, and bring to a boil. Reduce the heat to medium-low, cover, and simmer until the cauliflower is tender, about 30 minutes. Let cool slightly. Working in batches, purée the soup in a food processor or blender. Return to the pot and add more broth if needed to reach the desired consistency. Taste and adjust the seasoning. Stir in the lemon juice and cream, if using. Serve the soup, garnished with the crispy pancetta and gremolata.